What? It seemed counterintuitive. That’s where shoes go. But when Batista explained her reasoning for exiling shoes from their rightful shelves, it started to make more sense. Why you should be taking your shoes off outside your home. We all know someone (or maybe you are that someone) who operates a strictly shoeless home. Shoes carry the outdoors in and definitely contribute to dirt and grime buildup in our spaces. Instead of taking your shoes off when you walk in and then storing them in your closet, Batista recommends banning them from the inside of your home altogether. For reasoning, she points to studies like a 2016 one out of the University of Arizona, which found the average shoe sole contained 421,000 different kinds of bacteria—90 percent of which was transferred to clean floors right away. While there’s already a lot of bacteria in your home (and that’s not a bad thing, by the way), some of the grime on shoes can be particularly nasty. Batista references Coliforms, an indicator of disease often found in feces, as well as E. coli, as examples of things we could be unwittingly tracking in. While science has yet to prove that the germs on our shoes can directly make us sick (and the research that has been done on the topic has been on specific categories of people, like dog owners and athletes), Batista lives in the “better safe than sorry” camp and says we’re better off annexing dirty soles—especially from small spaces with limited airflow like closets. She also says that leaving your shoes in the closet may lead to more dust mites—teeny-tiny critters that feed off dirty fabric and furniture in nearly every home and may trigger allergies. Start by vacuuming the floors. 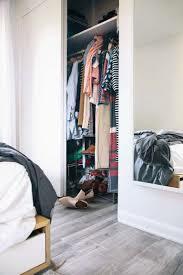 Then, remove all of your clothing (this is a good opportunity for a quick Kondo, too). Wipe down the shelves with a microfiber cloth that’s been lightly sprayed with water. Refold clothes and put them back in a way that makes them easy to see and access. If that means investing in a few clear storage boxes, so be it!